I want to share a few pics of Race and Rosie, two new doggy friends. I mentioned them a couple days ago; Sniff Seattle Dog Walkers has expanded once again, and we’re now providing our services in the Shoreline area. Let me tell you about Rosie. Rosie’s about three months old; a full Chocolate Lab. She’s 100 percent puppy — joyful, playful, sometimes uncoordinated, and a fast learner. We’re providing our Puppy Out Relief service. Three visits a day. Some of the time, it’s walks with leash, potty and command training. Other visits are potty breaks and playtime. 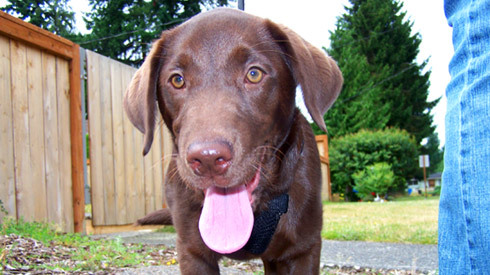 Shoreline Gets Dog Walking, Pet Sitting And Puppy Care Services From Sniff Seattle! It’s a just a couple extra blocks for us. But it’s a HUGE relief for so many people. We’ve been talking to a lot of pet lovers living in the Shoreline area, just outside the Seattle city limits. The thing we’ve heard the most from these wonderful dog and cat owners is that it’s been difficult finding quality pet care service. Today, we hope to help end that frustration. Sniff Seattle Dog Walkers is providing our complete array of exceptional dog walking and pet sitting, taxi and grooming services to everybody in Shoreline! In fact, we just started today with two wonderful dogs, Race and Rosie! Race is a Chocolate Lab/Springer Mix. And Rosie’s a puppy, full Chocolate Lab. Their owner wanted a few walks. But more important to her was that her babies had companionship. So we’re making three visits a day to hang out with these sweet dogs — lots of playtime, fetch, attention and love…and a walk or two. In other words, we designed the perfect puppy care plan for her pooches. That kinda “go-the-extra-mile” service is what Sniff Seattle Dog Walkers is all about. 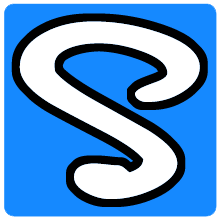 And now, we’re happy to say we’re available in Shoreline! Don’t be surprised if you see a Chihuahua behind the counter the next time you’re at the gas station or 7-Eleven. Check out Paco, the crime fighting Chihuahua! This little guy almost thwarts an armed robbery in Altadena, CA. 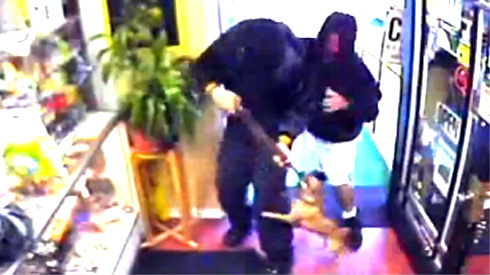 Two armed robbers flee the store mid-stickup after Paco lets out a torrent of barks and comes charging, forcing the masked gunmen to leave cash behind. And it’s all caught on the store’s security camera (video below)! Turns out Paco’s a rescue dog who spends his day roaming from shop to shop in the neighborhood. Looking for bad guys, no doubt. Our friends across Lake Washington in Kirkland have an opportunity to get a brand new off-leash dog park. The city’s one of 15 finalists vying for a $100,000 grant in a national contest. Just so you know, we’re not impartial on this. We support our “home team,” of course! I know readers of this blog are worldwide . That means a few are probably located in other finalist cities. If you’re in one of those places, please move on to the next thing you’re doing today and pretend you never saw this information. If you could build the perfect dog walker, you probably start by making her someone who absolutely knows what she’s doing; a person with that intangible “doggy sense” to communicate with your furry family member. And you’d want the perfect dog walker to be someone passionate; who loves your dog like it was their own. Someone who arrives early and leaves late, always ready to spend a mutually playful time together. Finally, you’d want — no insist — the perfect dog walker be someone who’s reliable, rain or shine; Someone who’s responsible, trustworthy and capable of making the right decision every time. The perfect dog walker would be someone who could relieve you of any daily stress or worries about your pet so that you could go about your day with peace-of mind. Add pet sitting to the equation, and you’ve just summed up who we are and what we do at Sniff Seattle Dog Walkers! Give us a call when you get the chance seven days a week. PUP Dog Rescue (People United for Pets) is throwing another adoption event this weekend. 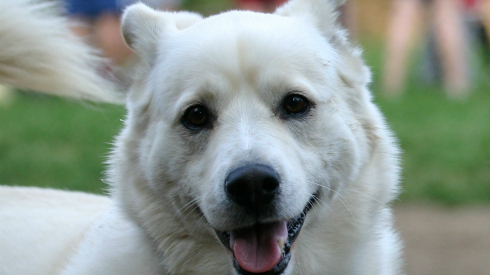 You can find a loving companion on Saturday (7/16) from 10 a.m. to 2 p.m. at the Petco in Issaquah. And you’ll be saving another great dog rescued from a high-kill shelter. Find out more about PUP’s event HERE! And bless their hearts for that!